Well, well, well. Can you even believe it? A YEAR!!? 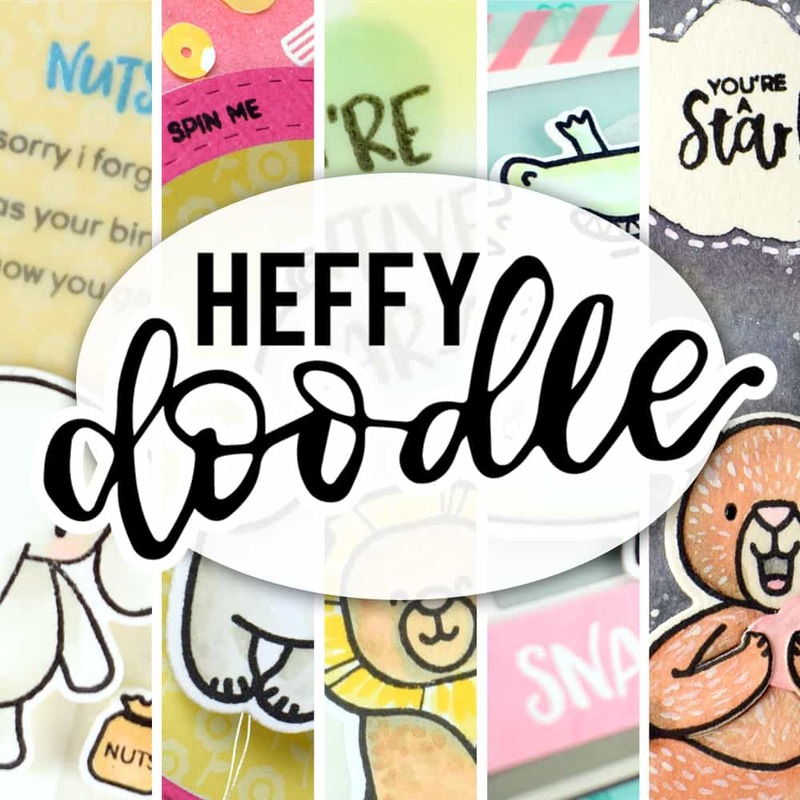 If you have come here from Amy Rysavy‘s blog, then you have made it to the last stop on our Heffy Doodle Birthday Blog hop! WOOHOO! 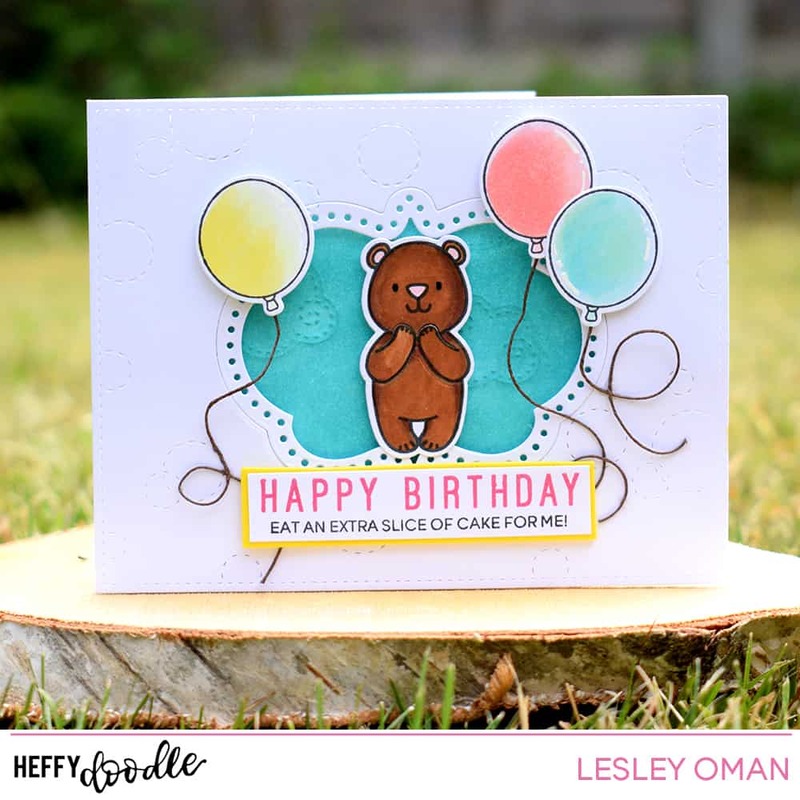 For everyone else, you might want to head on over to the Heffy Doodle blog to start this hop, as it is jam packed full of amazing projects! 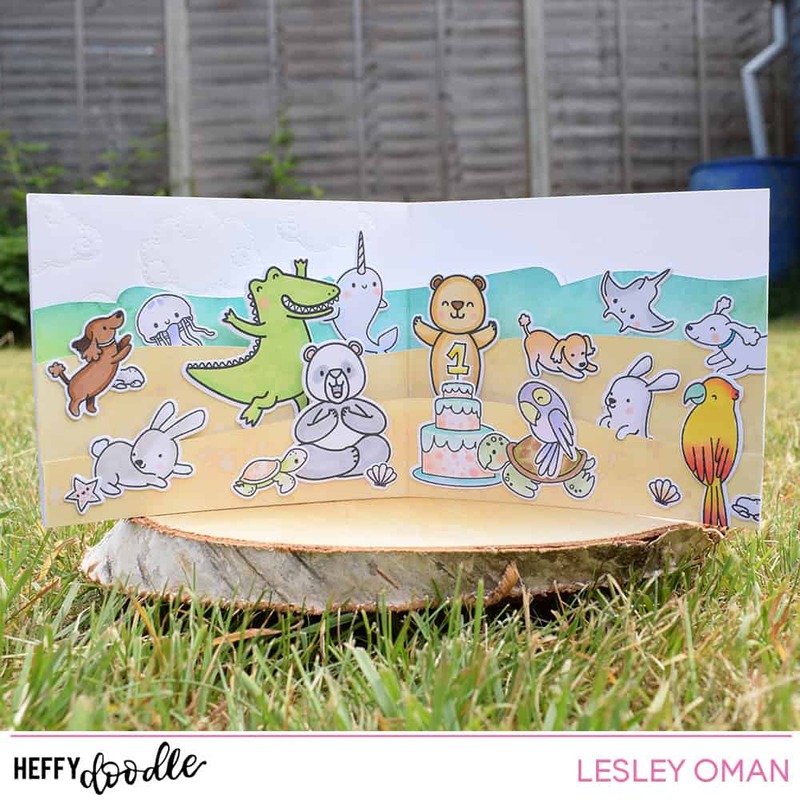 So, in case you don’t know, my name is Lesley Oman and I am the founder and creator of Heffy Doodle. For many years my hubby told me to create my own range of stamps, and last year I finally decided it was time to appease him. 😀 I drew some designs and started planning a Kickstarter campaign. It was exactly 1 year ago today that I shared my big secret plans with the world! I cannot believe how time has flown by, and I still marvel at the wonderful support I receive from customers, friends, family and this magnificent industry! I would like to say a massive thank you to each and every one of you for the part you have played in the development of my dreams. …. Enough sappiness, because its time to celebrate! Two lucky winners will receive a £50 gift voucher to the Heffy Doodle store. Leave a comment before noon on 26th June to qualify. The winners will be announced on the Heffy Doodle blog on June 24th. Now, let’s take a look at my project! Birthdays are cause for celebrations and BIG PARTIES, so i wanted my card to be exactly the same. I actually created the inside first, but before we go there, here is the outside. The background was created using the Heffy Doodle Stitched Bubble Background die and I cut the frame into it using the Lucky Clover Frames set. The bear is from the Unbearable Without You stamp set, balloons from the Party Palooza set, and I stamped a greeting from the new Everyday Sentiment Duos. I even used the NEW Heffy Memo tape to mask the stamp so i could get two colours. So tell me, do you think this lil bear looks pleasantly surprised? All his sweet friends have thrown him a beach birthday party! WOO! 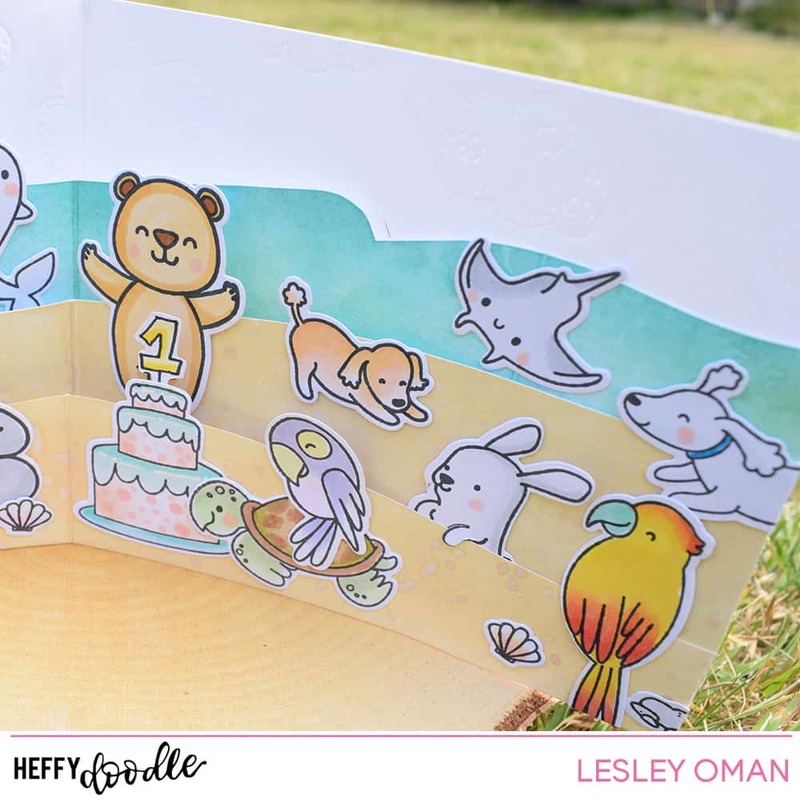 Of course i had to do it at the beach, because then i could include some of the new ocean critters from Oceans of Love and the turtle from the Shellabrate exclusive freebie ( you get it for free when you spend £35 in the Heffy Doodle store). For the sky, i embossed the Swirly Cloud dies, and used distress inks and oxides for the sea and beachy mounds. Then it was stamp, colour and die cut for all my cute critters. I have used Happy Snappy Crocs, Honey Bunny Boo, Yappy Happy Mail, Oceans of Love, Unbearable Without you, Party Palooza and wingman (and the Shellabrate exclusive). For the number 1 on the cake, i just drew this freehand. I kinda wish i was at this party! Don’t you! As an extra special treat, Heffy Doodle are offering a special coupon in celebration of our birthday. Get 20% off with the following code, valid between 13th-17th June 2018, in the Heffy Doodle Store. Thank you once again for all your support! If you would like to see the full blog line up – here it is! 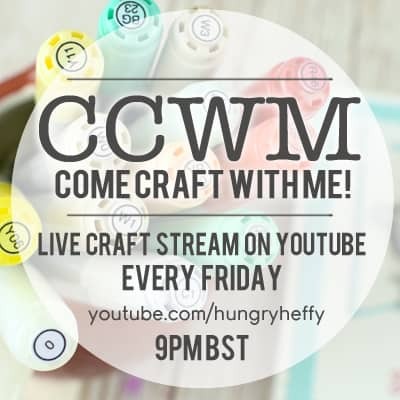 Because many of you may be new to my personal blog, I wanted to quickly say that nearly every Friday evening, I have a LIVE crafting stream over on my YouTube Channel. We start at 9 pm BST and would love to have you join in! I create lots of cards, share techniques and generally have a good giggle with all the viewers! I occasionally do ad-hoc LIVES so if you want to be in the loop, check out the notification settings when you hit subscribe. I hope you will Come Craft With Me! quite surprised by his party!! Beautiful cards. Love all the critters together all happy. I’ve enjoyed this hop. Happy Birthday Hefty Doodle. OMG! How cute and adorable did these cards come out! Beautiful design!!!!!! OMG today was the first time I have seen your products and the June release is absolutely perfect, love your stamps and the stencils are very versatile. Happy birthday, now I have to go check out the website. Oh my gosh this is amazing, wonderful card! Happy birthday and congratulations on succeeding with your dream. I love your designs and will have to get some more after having seen all the beautiful designs on this hop. And lastly: Beautiful birthday card. Awesome card! Thank you for the inspiration! Now that’s a beach party birthday card!!!! Funtastic!!! Oh this card is so FUN!! I love the adorable front but the inside is a work of art!! Totally lovely design!! What a very fun birthday card! The one who receives it will be so pleased. Thank you for sharing your talent! Such a very special card. Love how you created the inside of your card. Amazing! Happy Birthday to you. Happy Birthday to you. Happy Birthday Heffy Doodle. Happy Birthday to you! 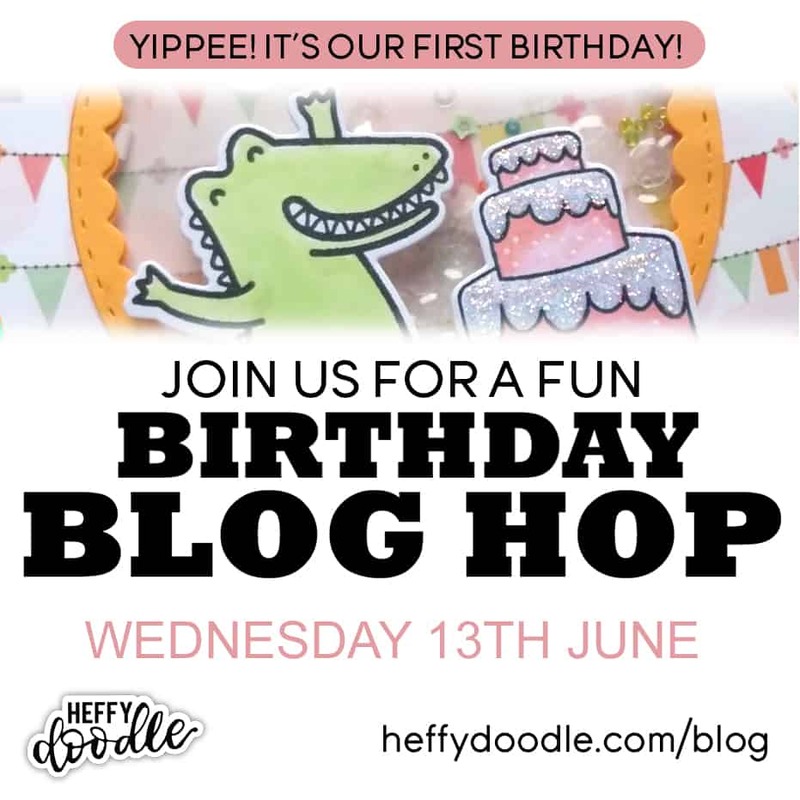 What a wonderful Blog hop for your first birthday. What a great card for a birthday celebration. And such a fabulous June release., so excited to get my hands on all these wonderful products. Looking forward to many more happy years. I loved seeing all the different critters on your card! ADORABLE! Your critter cards are so adorable! It’s hard to pick a favorite from all the sweet animals. Congrats and happy birthday! You have created a company that makes amazing stamps! Your card is just so cute! What a cute pop-up card ! Loved the beach scene . Absolutely adorable card. I really like the dotted frame and the way you created the inside of your card. Happy 1st Birthday! I’ve been loving all of your cute stamp, especially the alligator. Can’t wait to see what you keep coming up with. I love all your item and thank you for the opportunity! Wow, I started here, then went back through the rest of the hop… all-star lineup and really fabulous cards!!! ❤️ Over the moon for you! So cute – love all the adorable little critters. OMG! What a great surprise on the inside! TOO CUTE! you create an amazing scene, so beautiful!!! Congratulations and huge big birthday wishes. Awesome blog hop with awesome products. Thank you. This is such a fun card! Love the surprise inside. Happy Birthday Heffy Doodle – I remember seeing your kickstarter and falling in love with the stamps. They’re so cute and I’m still really happy that I was able to back you. Big congratulations on the fabulous success you’ve had – so well deserved! So cute–it is a party on the inside. I love this card! I’m glad to see you used all of your critters! The Snappy Croc is still my favorite, but I adore the parrot riding on the turtle! Congratulations on your first year–wishing you many more! Happy crafting! Happy happy birthday!! I am so happy for you that your dream come true! your cards are Fabulous!! Just love all those well-wishers inside your card! Super fun and totally festive! Congratulations on your first year and wishes for many more! What an amazing card! So perfectly represents a celebration. Happy, happy birthday Lesley, you have made a wonderful achievement in your busy first year. Love your card and your colouring and inside with all your Heffy friends, so cute and adorable. I am sure all of your ‘human’ Heffy friends are looking forward to seeing the heights you achieve. Don’t eat all the cake (must have champers too). OH MY !!!!!!! WOWZERS. This card is absolutely brilliant!!!! What a way to end the hop. Thank you for sharing! Congrats! What an adorable project and awesome inspiring blog hop! I mentioned this on the HD blog, but I was really surprised to find out this was only your first birthday! You have a great, distinct style that makes it seem like you’ve been in business for longer. I love this card idea of all the animal friends showing up for a party. Thank you for this generous hop and providing us with so many fun stamps. Here’s to many more birthdays! Congratulations! So happy for you!! Great card! Gorgeous cards Lesley. Thanks for sharing with us. Amazing! I love love love your card! and Congratulations on celebrating one year! What a lot of work but what a beautiful surprise! That is a card I would keep forever! Fantastic card! I love all the critters on the inside – such a great party! Love this adorable card. Even the ocean critters joined in to celebrate. Thanks for sharing your creativity. So many cute critters I love I Think!!! Hello. 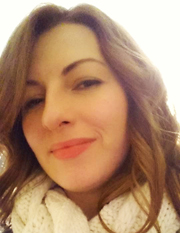 I'm Lesley and welcome to my blog! I love to get inky and share my crafty creations. Chibitronics and Lawn Fawn Collaboration Kit!